Candida infection of the esophagus can present with a range of clinical findings (Box 1). Between 20 and 50% of patients may be asymptomatic. Others will note dysphagia, odynophagia, epigastric pain, nausea and vomiting, or hematemesis. Fever may be present. Frequently, patients will have concurrent symptoms of oral thrush. Physical exam of patients with esophagitis yields few clues to its diagnosis. Oral thrush is seen in the majority. 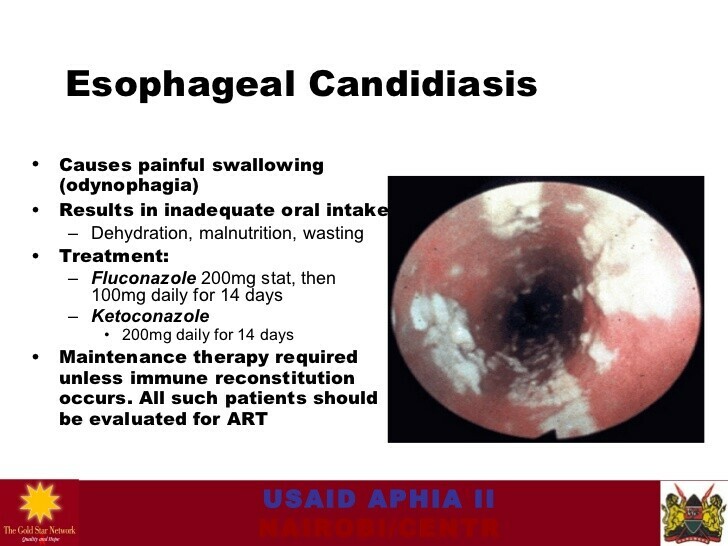 Barium studies and endoscopy are both useful for diagnosis of Candida esophagitis. The findings found with these methods are described in the diagnosis section. Candida esophagitis may be confused with other causes of esophagitis, including bacterial, viral, and reflux esophagitis. Host factors (such as the status of the immune system), clinical findings, and endoscopic appearance of the esophagus are helpful in making this distinction, although frequently more than one cause of esophagitis are present concurrently. Complications of esophagitis relate to deep invasion and inflammation of the mucosa. Although uncommon, perforation and strictures do occur. In some cases, long and complex strictures are not amenable to endoscopic dilatation and require surgical intervention. Dissemination of the fungus from the lower esophagus and stomach may occur, especially in neutropenic patients. Radiographic techniques using barium contrast (barium swallow) and endoscopy are useful for diagnosis of Candida esophagitis. The barium swallow has a characteristic appearance, with a shaggy-appearing mucosa and sometimes nodules and cobble stoning. This technique does not allow firm diagnosis, which requires histology or culture. Endoscopy is the preferred method of diagnosis, as it allows direct visualization of the mucosa and biopsy of affected areas. The mucosa typically has adherent white plaques that may be removed with the endoscope to reveal an erythematous mucosa. Brushings of the mucosa may be prepared as for oral disease. Histologic specimens reveal fungal elements, which are more apparent on PAS-stained and silver-stained material than with hematoxylin-eosin staining. A subset of patients may be treated empirically. In those with HIV infection, oral thrush, and mild to moderate symptoms of esophagitis, treatment with topical agents or an azole may be warranted. If no oral thrush is present, or if treatment fails, endoscopy should be performed to exclude other causes of disease. As with oral thrush, topical agents may be successful in treating esophagitis (Box 4). If patients fail topical treatment, have severe disease, or are considered to be at high risk for disseminated disease, systemic therapy should be used. Therapy for 10 days is generally adequate.